So I then decided to make a brownie mix and put a cherry and some brownie mix in each hole of a mini muffin tin. 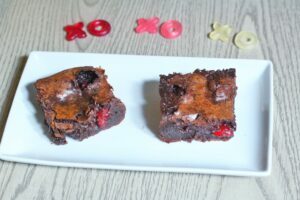 I made just a few of these to test it out, but if you’ve ever made my Better than Box Mix Brownies, you know they are super ooey gooey and that makes them impossible to cleanly remove from a muffin cup! 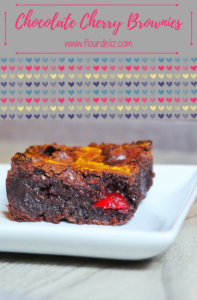 And if you haven’t made my Better than Box Mix Brownies…what are you waiting for?! Luckily I only made a few to test, so I didn’t waste much. So now I have most of a brownie batter, and a bunch of ganache soaked cherries. What to do?! I poured about half the brownie batter into an 8×8 pan, covered the top of the batter with the spiked ganache covered cherries, poured the rest of the brownie batter on top, and baked. 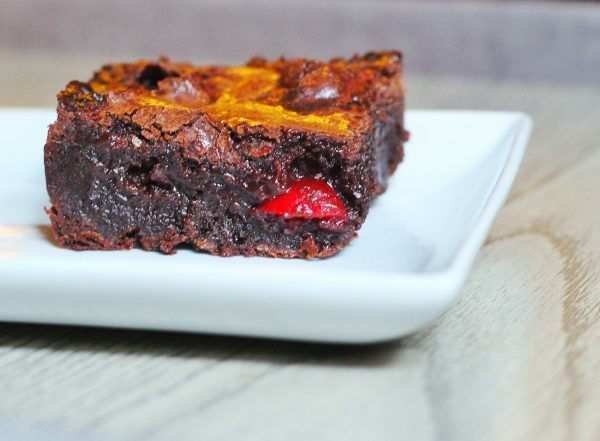 The bright red cherry against the dark chocolate of the brownie is just so gorgeous, and that cherry chocolate flavor combo is on fleek. Do people still say that? Is that a thing? Well, it’s really good. 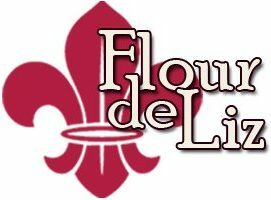 And you get that hint of bourbon or vodka and the ganache gives it a little boost of chocolate gooeyness. 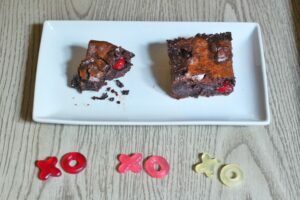 I’m just saying, if you serve these for Valentine’s day, you will win hearts for life. Pour liquor into the jar and let the cherries soak overnight. 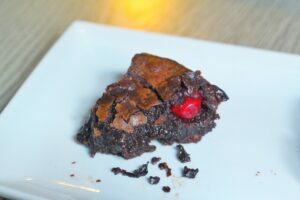 Using a fork, dip the cherries into the chocolate, shake off the extra, dripping chocolate and place on wax paper to cool. 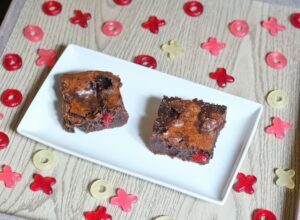 Once all cherries are dipped, put the dipped cherries in the fridge while you prepare the brownie batter. Preheat the oven to 350 F. Line a 8x8 pan with non-stick foil. Prepare the brownie batter according to directions. Pour about half the batter into the pan. Line the top of the batter with the cherries. You can spread them out as much or as little as you'd like. Pour the remaining batter on top and bake about 30 minutes, until the top is crackly. Remove from oven and let cool. Cut into squares, and enjoy!